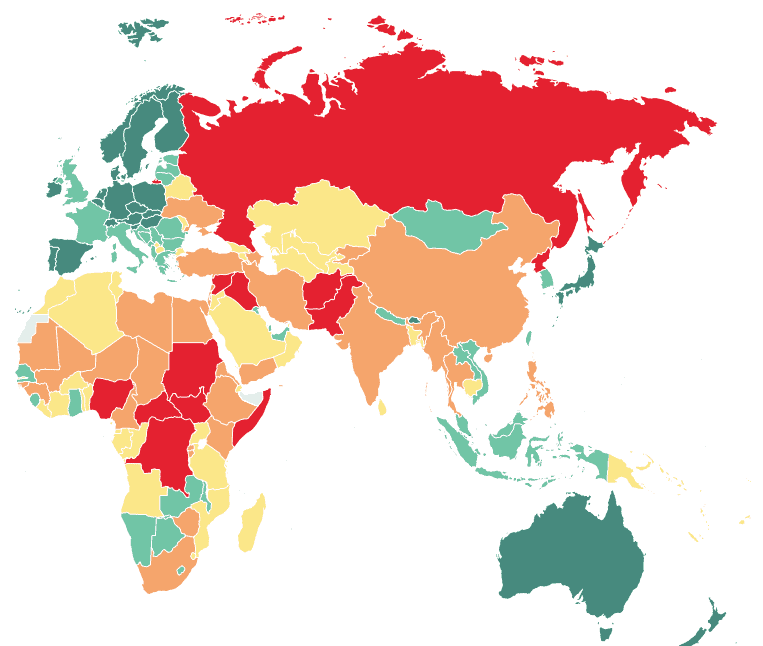 Earlier this year, the Institute for Economics and Peace released its GPI – Global Peace Index. Tiny spoiler alert: the United States ranked 94th. The GPI measures the relative position of nations’ and regions’ peacefulness, taking into consideration statistical factors such as murder rates and military expenditure, but also including nuclear and heavy weapon capability and the level of perceived criminality. In total, there are 22 indicators, which you can see here. The Index has received endorsements as a political project from a number of major international figures and is generally regarded as acceptably accurate, for a topic that is bound to create polarizing opinions. The criticism that can be brought to it is that is doesn’t really take into consideration violence against women and children, but it’s pretty much the best thing you can use to gauge a country’s relative peacefulness. The Czech Republic is perhaps the only surprising one on the list, with countries like New Zealand, Denmark, Switzerland, and Finland commonly found on the “best of” lists of countries. Taking Iceland for example, they have almost no military spending, just 0.13% of their GDP, compared to UK (2.49%) or the US (4.35%). They also have extremely low levels of crime, and even political disagreements tend to be very peaceful. Fellow northern Europeans Sweden and Norway trailed a bit behind despite their perceived neutrality, mostly due to their higher crime levels and weapon export. The unstable situation in the Middle East (read: War Zone) has obviously made a massive difference. In 2008, Syria ranked 88th out of a total of 162 countries, so about in the middle of things, but due to the civil war and the rise of ISIS, Syria is quite possibly the most dangerous country to be in at the moment. Iraq and Afghanistan have a lot in common with Syria, and the continuous Civil War going on in Sudan, despite not making news that often, is also devastating. The fact that nine countries are considered worse than North Korea is quite telling. The War on Terror is taking a massive toll. Ukraine was considered the 13th most dangerous country on Earth, ironically less dangerous than Russia (11th), the country that forced them into war. 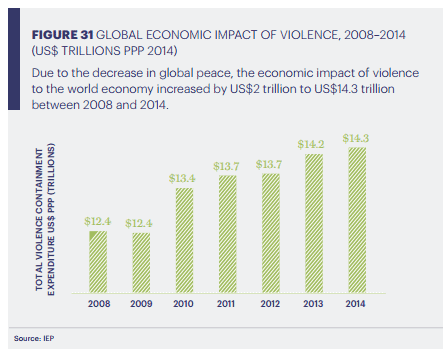 They report that the effects of worldwide violence and conflict have risen since 2008, which reflects a deterioration in global peace. 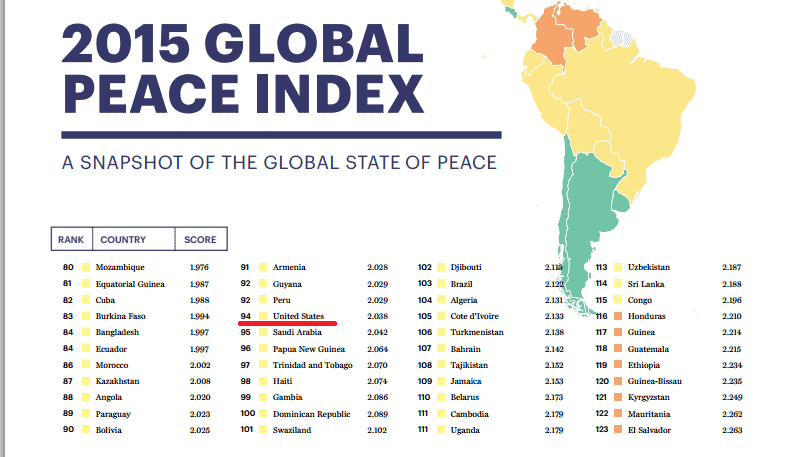 So, we know the most peaceful and least peaceful countries, but where are the big countries? Where’s the US and UK, where’s China? Well, the US ranks in at 94/162 – worse than Syria was 7 years ago. They rank just below Armenia, Guyanam and Kazakhstan, and just above countries like Saudi Arabia, Haiti and Papua New Guinea. The United States is by far the biggest contributor to military expenditure, accounting for over US$1.3 trillion alone, while China is the second largest contributor with US$370 billion. Overall, China comes in at 124, and the UK at 39. The conclusions are difficult to draw, but there are some worrying trends. It’s almost natural for some areas to be more violent than others, but things can chance extremely quickly. Syria went from being a moderately peaceful country to being the least peaceful on the planet in just a few years, and the overall trends are not encouraging.